You can now buy the same buttery-soft Soakers that are included with a standard GroVia O.N.E. Diaper, separately! The new O.N.E. Soaker Sets include one large and one small Soaker that can be used individually or together for maximum absorbency. O.N.E. Soaker Sets are perfect for replacing current Soakers or having extra absorbency on hand for any diaper. Please note that O.N.E. Soakers do not snap into the GroVia Hybrid System. GroVia Soakers are designed with unique channels that direct liquid down into a core composed of their one-of-a-kind cotton, making them extra absorbent. 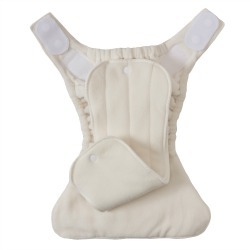 Top it all off with a layer of cozy microfleece and you have a trim Soaker set that dries quickly and provides total comfort against baby's skin. Made to be snapped into a GroVia O.N.E. Diaper. Use: Simply snap GroVia Soakers into your GroVia O.N.E. Diaper or lay in another cloth diaper system. Use one or both Soakers based on situation. I'm so glad these are sold separately! When my super-soaker started soaking through his ONEs, I was frustrated, but these were the perfect solution. I bought a few sets and now I just use two large soakers in each ONE (instead of one large and one small) and they work great again for my 2.5-year-old who isn't ready for potty training yet. 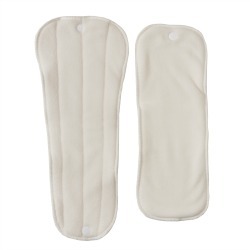 The absorbency on these is awesome, bought an extra one as backup and it comes in handy on laundry day. GroVia ONE's are one of my favorite nighttime solutions! We bought some pre-loved ONEs and the inserts needed to be replaced. These soakers are so absorbent and last overnight on our baby for 10+ hours! FYI- These soakers are not compatible with GroVia AI2 shell snaps. They can be laid inside though.